Huesca, 1, 07840 Santa Eulalia del Rio, Spanje. 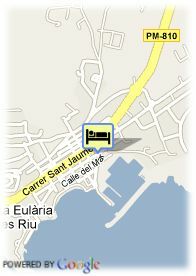 Hotel located in Santa Eulalia town centre. 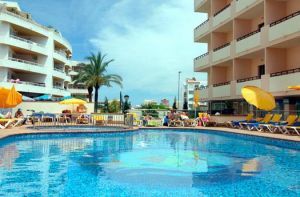 Hotel situated in the tourist area of Santa Eulalia, at just 50 metres from the seaport and the seafront promenade and at 250 metres from Santa Eulalia del Río beach. The city of Ibiza is at 15 kilometres. In the hotel surroundings there is a slew of shops, restaurants, cafeterias, bars, ice cream shops and discos. This location allows to fully enjoy the wide tourist offer of the island, from the well known discos to the most hidden coves. The establishment´s 180 rooms have terrace and some of them have hydromassage bathtub. The buffet restaurant has show-cooking service. Honoured with the Q certificate for Quality in 2004.